The Hunger Games: Catching Fire, starring Jennifer Lawrence, reviewed. Jennifer Lawrence in The Hunger Games: Catching Fire. 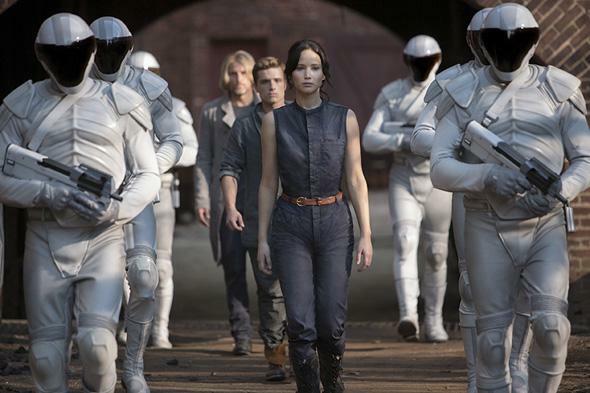 The Hunger Games books and films come to fill a psychic void left by the Twilight series. For whatever reason, it seems our culture right now needs a mega-selling YA franchise built around a beautiful, stubborn teen heroine who waffles endlessly between two inexplicably patient lovers as she battles to save the world from malevolent forces. I’m not being facetious; this is an enormously appealing fantasy and a refreshing change from the male-dominated comic book universe that supplies most blockbuster franchises with material. Of course, there are sharp differences between the two series: Katniss Everdeen, the fiercely independent bow-and-arrow-wielding protagonist of Suzanne Collins’ Hunger Games books (played on screen by Jennifer Lawrence) is a world away from Bella Swan, the passive, lovesick heroine of Stephenie Meyer’s Twilight. Also, Collins’ books attempt to take on larger social and political issues than Meyer’s narrowly focused domestic melodramas: Though the Hunger Games trilogy is set in the repressive futuristic dystopia of Panem, the materialism and celebrity culture Collins’ books satirize are recognizably contemporary. Between the covers of a book, I vastly prefer The Hunger Games to Twilight—Collins’ prose is vivid and sensorially precise, with end-of-chapter cliffhangers to beat the band, while Meyer’s endless, static descriptions of glittering vampire skin seem to make each page weigh a hundred pounds. But on screen, the Twilight movies pulsed with a weird, pulpy energy that only got weirder and pulpier as the series went along. The Hunger Games films, on the other hand, have yet to take a tip from the subtitle of the just-released second installment and really start catching fire. There’s something a bit cautious and prestige picture-ish about both movies so far, as if the filmmakers were afraid to explore the darkest implications of their kids-killing-kids premise (or maybe just afraid to get saddled with the PG-13 rating that would drive away their most eager audience). That said, The Hunger Games: Catching Fire, directed by Francis Lawrence of I Am Legend, is in many ways an improvement on the first film, which was directed by Gary Ross. The shaky you-are-there documentary-style cinematography has been replaced by a smoother, steadier camera (wielded by Jo Willems) that takes time to linger on faces and intimate exchanges among characters. Much of the complicated world-building exposition is out of the way by now, allowing us to spend more time encountering the creepy plutocracy that is Panem. And a new costume designer, Trish Summerville, has been brought on—a crew position that means a lot in a film in which fashion plays as large a role as it does in Catching Fire. After all, the revolution that begins to spread throughout Panem in this middle chapter takes as its secret emblem a piece of Katniss’ jewelry—a gold bird pin she was given at the beginning of the first film—and one of the movie’s emotional high points involves a flaming wedding dress that converts, spectacularly, into a symbolically significant winged black gown. Insofar as Catching Fire does ignite, the match to the flame is Jennifer Lawrence, who gives Katniss layers she lacks even in the books’ fairly rich characterization. When the first Hunger Games film came out, I wrote that it was with this role that Lawrence officially acceded to the title of movie star. She’s been one for a while now, and hauling around the little gold statue she won in February for Silver Linings Playbook has only built up those movie-star muscles. Lawrence is a superbly intuitive actress who never settles for a conventional line reading when there’s a fresh, off-kilter one to be had, and she lifts up a lot of this movie’s sometimes less than sparkling dialogue. But she’s also a one-woman charisma factory who somehow projects at once supreme self-confidence and humble vulnerability (as demonstrated in her absurdly winning fall up the stairs on her way to accept her Oscar). Though the movie’s last third is devoted to the gladiatorial games of the title, The Hunger Games: Catching Fire is in large part a movie about learning to be a celebrity, and J-Law has plenty of material to draw on in that department. Katniss’ best friend since childhood, nature boy Gale Hawthorne (Liam Hemsworth) waits for her back in their native, blighted District 12. Gale grows more and more radicalized as he watches the elites of the Capitol—led by the nefarious President Snow (Donald Sutherland)—manipulate Peeta and Katniss’ celebrity to distract the masses, while the police state cracks down on even the mildest protest with ruthless violence. When Peeta and Katniss begin speaking truth to power at their public events, President Snow and his chief gamesman Plutarch Heavensbee (Philip Seymour Hoffman) decide to design a special Games that will take out the rebellious couple while also turning public sentiment against them. After the young contestants enter the arena—a huge expanse of jungle watched over by hidden cameras and enclosed by an invisible dome—both the political and romantic plots are shelved while Peeta and Katniss, along with a few fellow contestants who become their wary allies, contend with poisonous fog, twice-a-day lightning storms, and packs of crazed mandrills. Though some of the chases and escapes are thrillingly filmed, this last section of the film feels indistinguishable from plenty of other video-game-style avoid-the-obstacle action climaxes. I preferred the scenes in the decadent, vaguely fascistic Capitol, especially those involving Effie Trinket (Elizabeth Banks), Katniss and Peeta’s magnificently garbed image consultant/brand stylist, and Caesar Flickerman (Stanley Tucci), the flamboyant, ever-smiling TV host who interviews the doomed game contestants on the eve of their likely death. In the trilogy’s final chapter, Mockingjay (which I haven’t read yet but plan to before the first installment of the two-part movie based on it comes out in 2014), I suspect this hypocritical pastel-wigged lot is going to get their revolutionary comeuppance. May the odds be ever in their favor.